“What if God, desiring to show his wrath and to make known his power, has endured with much patience vessels of wrath prepared for destruction” (Rom. 9:22)? As Christians in the Reformed tradition, we affirm the biblical view of providence that affirms the world is governed by God’s sovereign ordination (Eph. 1:11). The length of our lives, the color of our hair, your reading of this magazine, and everything else that ever happens was decreed by God. In ordaining certain events, God did not first look into the future and then, seeing how they would transpire, ordain them. Rather, God ordained them, including the means through which the events occur. Those things that God has ordained include also the eternal salvation of His people, thus leaving the rest of mankind eternally damned. In Romans 9:13, Paul uses the example of Jacob and Esau to demonstrate that salvation and damnation are the results of His sovereign choice. 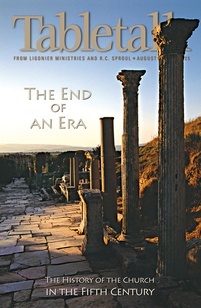 From eternity past, God permitted Esau’s (and the rest of humanity’s) fall into destruction. In today’s passage, Paul addresses the objection that arises from this teaching. How can God be just and yet punish some people if their wickedness and condemnation is foreordained? Romans 9:14–24 answers this question by appealing to God’s authority and glory. As the Creator, God has the right to do with His creation as He pleases. God is just and His glory is manifested in punishing those whom He has ordained to do evil just as a potter has the right to make some vessels fit for destruction (vv. 19–24). This decree of reprobation is God’s action in leaving some people in their state of sinfulness, thus leading to their damnation. The verb “prepare” in verse 22 is passive as opposed to its active use in verse 23, where it refers to God’s work of election of some to salvation. Out of the mass of humanity God actively elects some to salvation and passes over the rest, leaving them in their wickedness. Though it remains mysterious as to how God ordains all things and yet is not responsible for evil, we must affirm both truths. It does help us to see how God is just when His decree of reprobation is passive, not active. It also strengthens our assurance to know that God’s electing grace is so active and sure that we will love Him forever. Many misunderstand Reformed theology to say that God forces some to go to hell against their will. Though God does indeed pass over some people, He never acts apart from their desires. In our natural state since the fall, all men truly desire hell because they truly desire evil. Some of these He passes over, but in mercy He has chosen to change the desires of others so that they will love Him forever. Thank God for mercifully changing your heart.